If you are operating with limited space in your vehicle and you fancy adding a little oomph to the factory audio, under seat subs make perfect sense. On the flipside, most standard under seat subwoofers are designed with space-saving in mind rather than pushing serious amounts of air and serving up heavy bass. 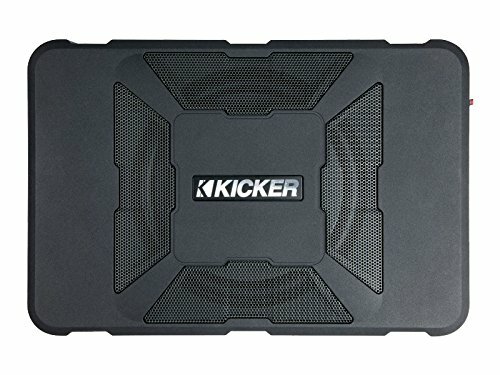 Kicker has a solid reputation for delivering top-notch car audio without forcing you to take out a bank loan. If space in your vehicle is at a premium, installing 8” subs is a smart move. The aptly-named Hideaway will fit neatly under your seats while still catering to your bass whims. Powered by a capable amp, this is an enduringly popular under seat sub with just cause. The Kicker Hideaway is a little bigger than some under seat subs but still qualifies as a compact model that can be stored here fuss-free. Since this powered sub has the amp included, it’s a very beginner-friendly entry point into car audio. 150 watts of RMS power in an 8” sub means you’ll get a surprisingly heavy bass without losing out on clarity. You’ll get a remote so you can tweak the bass levels without messing around. This comes with a mounting bracket so you can keep it within arm’s reach. While you’ll never achieve the performance of a sub twice the size, within this class of compact woofer, the Kicker is one of your strongest options for installation in tight spots. Sound Storm is a relative newcomer in the car audio space. Although some of their subs can be rather underwhelming, this low-profile 8-incher has strong-armed it onto our list, but why? Well, it fits neatly under your seats while doling out more bass than you’d imagine with a great deal of flexibility in terms of fine-tuning the audio. 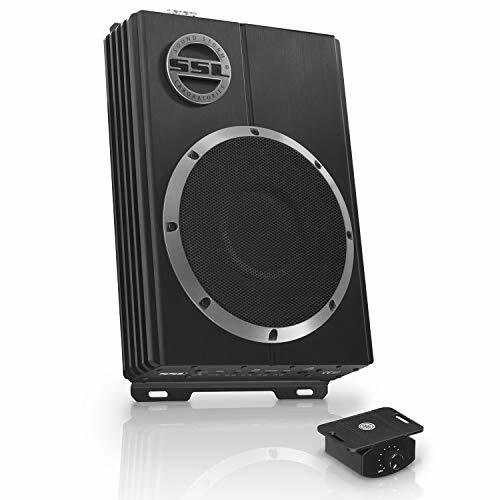 Sound Storm might not be the first name that trips off your tongue when thinking of subwoofers for your car but this nifty, compact 8-incher puts many larger units to shame. It’s also almost laughably cheap considering the performance you get in return. RMS power is 300 watts peaking at 600 watts which ensures you’ll get ample raw power while enjoying some corking low-end frequency. Packed with overload protection and boasting solid components, this sub is built to last backed up by a 3-year limited warranty for peace of mind. If you want the ability to tweak the levels from the convenient wired remote supplied and you’re looking for a compact sub that doesn’t stint on the bassline, we can’t recommend the Sound Storm highly enough. 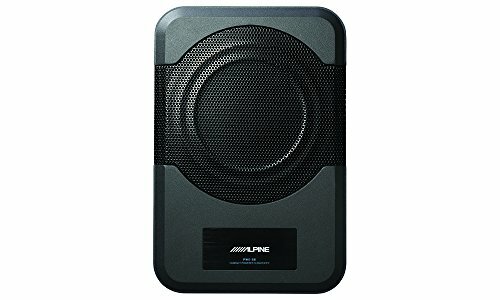 Alpine produce solid mid-range car audio which is fairly expensive but built to last and with a premium placed on sound quality. For a small 8” sub, you’ll get a nice depth of bass with a crispness and clarity you might not expect from a compact unit. Installation is a breeze and you can easily hook this woofer up to your exisiting system. While you could certainly get cheaper 8” subs, this under seat model from Alpine marries exceptional build quality with a sound that will impress passengers without annoying the neighbors. 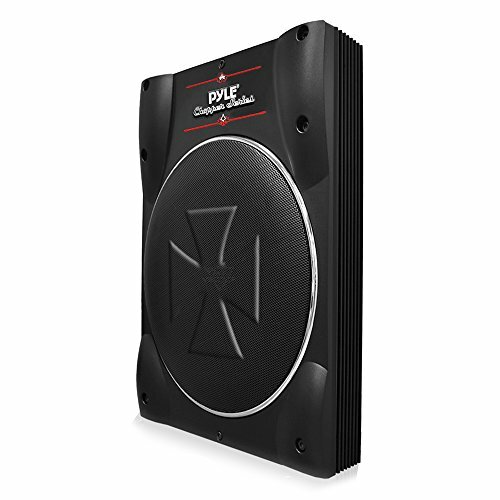 120 watts of RMS power doles out the bass you need without going over the top and shaking the windows. Low-frequency comes through with real liveliness and it’s an overall sound you just wouldn’t bank on from a scaled-down sub. If you’re looking for size/power ratio, you can buy bigger subs for similar money. The thing is, if you drive a sports car or truck where room inside is scarce, the last thing you want is an oversized unit you simply can’t accommodate. If you’re prepared to give an 8-incher a go, this Alpine will not disappoint. If you’re hunting for a complete package, this powered under seat subwoofer from the legendary Rockford Fosgate demands further investigation. Compact while still delivering volume and a rich bass, the built-in amp allows you to tweak gain and bass from the remote for maximum convenience when you’re on the road. 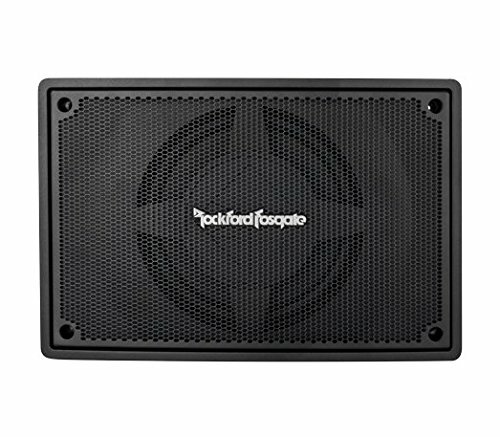 Rockford Fosgate have long produced highly capable in-car audio at affordable prices. With the Punch series, they continue to mine this lode and deliver a slimline 8” sub that requires very little space while still coming good on the bassline. Slotted into a custom sealed enclosure with integrated 150-watt amp, the Punch gives you a jab with some heavy bass followed up by a quick one-two of convenience married to build quality. If you’re picky about getting the sound levels just right, the remote lets you make minor adjustments without leaving the driving seat. From fine-tuning the crossover to tweaking the phase control, the flexibility of this unit is one of its key selling points. For an 8” sub expressly designed to sit under the seat of your pride and joy, this Punch could be the best investment you make this year. Most Pyle car audio is very low-end and cheap but, for this manufacturer, this slimline under seat sub marks a foray into more respectable territory. Focusing on power and sensitivity while also making sure the compact unit fits into awkward spots, it might be time to rethink what Pyle is all about. With under seat subwoofers, there’s always a degree of compromise involved. Whether it’s bass, volume or overall sound quality, you can’t have it all if you want a compact sub. Luckily, this 8-incher from Pyle manages to acquit itself well across the board. The RMS power that counts is 300 watts with peak at 600 watts. You can tweak the bass generated from the handy remote and you’ll get power to rival most subs in this class. And that’s the only fair way to compare woofers. It’s pointless setting this compact speaker against a 15” behemoth. Beyond more than ample bass, you’ll be rewarded with a sound that’s both rich and clear while at the same time distortion-free. And the best part? It comes in at an almost budget price so we’d urge you to set any prejudices aside and consider this nimble little under seat sub from Pyle. Kenwood has enjoyed a dominant position in the car audio industry since the 70s. With this powered and enclosed 8” sub, you get great sensitivity along with plenty of raw power, surprising when the unit is this small. For power to rival a trunk set-up with none of the weight and hassle factor, this Kenwood redefines what an 8-incher can do. If you’re just dipping your toes into the world of car audio, an all-in-one kit is a sensible option. With this Kenwood, you’ve got all you need to get going almost straight out the box. The only thing to check is that it’s compatible with your system as you might need to invest in a head unit packing a stereo line out. Although you’re not going to shatter any windows or burst eardrums with an 8” sub, the power you get from this 75 watts RMS unit is surprising. Bass is deep and rich while sensitivity is class-leading. This sub is by no means flawless but for a user-friendly starting point, slimline nature ideal for smaller vehicles and impressive overall sound quality, the Kenwood merits a place on your shortlist of the best under seat subs. Rockville make their presence felt on any list of the best car subwoofers and with this 10” under seat model they ramp up the power without increasing the size too much. A powered package, installation couldn’t be easier so it’s a great choice for beginners. Despite being a 10” sub, it’s less than 3” thick so should slip under your seat fuss-free. As long as you’re not expecting truly thundering levels of bass and you accept the limitations of under seat subs, this Rockville 10-incher packs a fair punch for a lightweight. 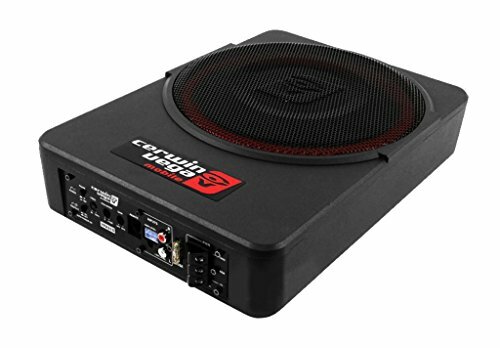 200 watts of RMS power and 800 watts of peak power might not be competition-level but you’ll enhance the low-end of your music nicely without that muddy, distorted sound that can mar cheap units. Think crisp and clear rather than window-shakingly thudding. 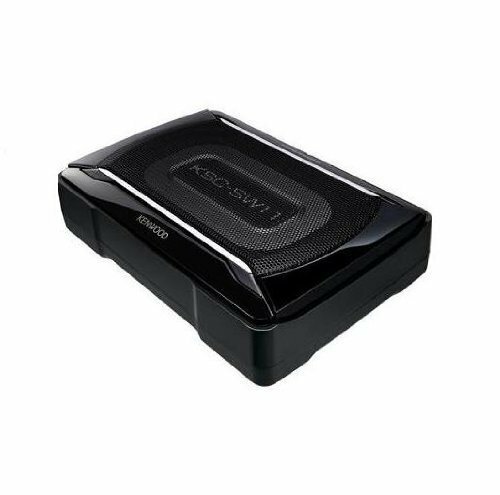 Sensitivity and frequency are respectable adding to the clarity of sound you’ll enjoy if you invest in this under seat subwoofer. You’ve got very little to lose by road testing this sub… If, within the first 30 days, you’re not entirely satisfied, return it for a refund. Beyond this grace period, though, customer service can be patchy at best. To round out our look at the best under seat car subwoofers, we’ve got another 10-incher, this time from Cerwin-Vega. The VPAS10 is this stellar brand’s first foray into powered, active subs and it’s a superb start. With a rugged build, compact footprint and enviable sound quality, this small sub is big on performance. 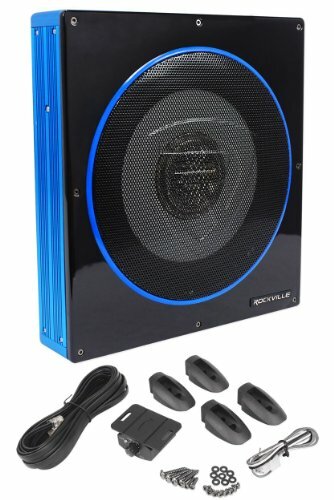 If you drive a truck or compact vehicle but want a beefier sub than the smallest 8-inchers, this active subwoofer complete with enclosure kicks out 200 watts of RMS power with a nice range of sensitivity into the bargain. The solid aluminum body sees off any rogue heat a treat and is built to withstand severe treatment without giving up the ghost. One snag is that the inbuilt amp only goes down to around 85hZ. This means you’ll struggle to hit anything much lower than mid-bass. That said, you need to peg your expectations when you’re buying an under seat subwoofer so this is not a deal-breaker. If you want a simple set-up and the ease of tapping into your exisiting system, this powered sub from a brand you can rely on is unlikely to disappoint. If you want the thundering thump of low-end bass, you’re better off thinking twice about an under seat model. We hope you’ve found some diamonds in the dirt in these under seat subwoofer reviews. If you know your stuff already, you’ll be acutely aware of all the important stats. If you’re just starting out, though, we’ve tried to outline the strengths and weaknesses of these subs in plain English. Come back soon for more advice on getting the best car audio without spending a fortune.